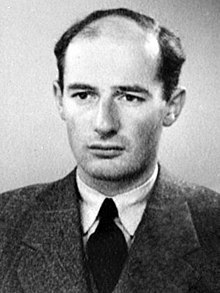 Raoul Gustaf Wallenberg (4 August 1912 – disappeared 17 Januar 1945) wis a Swadish architect, businessman, diplomat an humanitarian. He is widely celebratit for savin tens o thoosands o Jews in Nazi-occupied Hungary during the Holocaust frae German Nazis an Hungarian Fascists during the later stages o Warld War II. While servin as Swaden's special envoy in Budapest atween Julie an December 1944, Wallenberg issued pertective passports an sheltered Jews in biggins designatit as Swadish territory. ↑ The date o daith is based on a letter gien tae his faimily bi Soviet authorities in 1957 an is disputit bi some. ↑ "German's Death Listed; Soviet Notifies the Red Cross Diplomat Died in Prison". The New York Times. 15 February 1957. ↑ "Raoul Wallenberg". Notable Names Database. Retrieved 2007-02-12. ↑ "Archives Throw Doubt on Wallenberg Death Date". The New York Times. Stockholm. AP. 1 April 2010. Retrieved 2010-05-22. ↑ 5.0 5.1 "Yad Vashem database". Yad Vashem. Archived frae the oreeginal on 2007-02-07. Retrieved 2007-02-12. who saved the lives of tens of thousands of Jews in Budapest during World War II ... and put some 15,000 Jews into 32 safe houses. This page wis last eeditit on 12 August 2018, at 12:57.